Citation: Her SM, Kang DY, Eun LY. Serendipitous Marfan syndrome with unusual presentation in children. J Pediatr Health Care Med 2017;1(1):5-6. Marfan syndrome (MFS) is an autosomal dominant connective tissue disorder resulting from pathologic mutation of the fibrillin-1 gene (FBN1) on chromosome 15. The clinical features are not obvious in children, so diagnosis may be delayed if there is no family history. 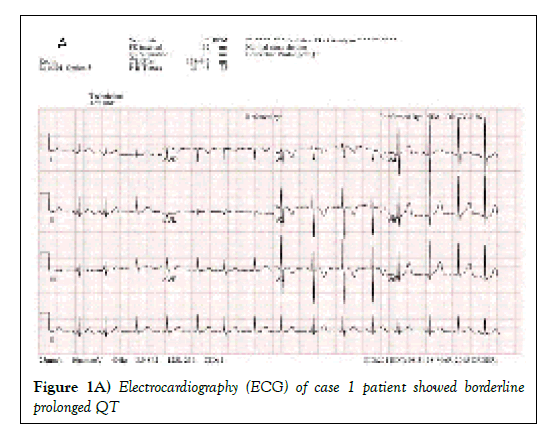 First case, a 6-year-old boy is referred for abnormal electrocardiography (Borderline prolonged QT) beforehand his tonsillectomy. His arm span–to-height ratio was 0.96 and other clinical features of MFS were not yet apparent. On his echocardiogram, the aortic dilatation (z score>2) was noticed and gene evaluation demonstrated missense variant (c.7606G>A) in 62 exon of FBN1 gene. 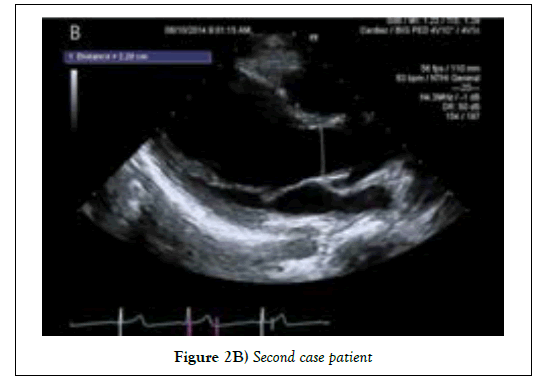 Second case, a 14-year-old healthy boy visited our hospital with dizziness and pre-syncope. We confirmed his high arm span–to-height ratio (1.01) and myopia. On his echocardiogram, the aortic dilatation (z score>2) was showed and he was diagnosed with MFS through the gene evaluation of missense variant (c.4267G > A) in 2 exon of FBN1 gene. Marfan syndrome is an autosomal dominant connective tissue disorder resulting from pathologic mutation of the fibrillin-1 gene (FBN1) on chromosome 15. The prevalence of Marfan syndrome is reported to be 1 to 2 per 10,000 people, regardless of race or gender . The main clinical features of Marfan syndrome include cardiovascular system, skeletal system, and ocular system. In addition, it can affect the pulmonary system, skin, and dura . The diagnosis of Marfan syndrome is based on revised Ghent nosology, and cardiovascular, skeletal, ophthalmic symptoms and genetic testing play an important role in diagnosis . However, the diagnosis may be delayed because clinical symptoms of Marfan syndrome appear as age-dependent manifestations and other clinical symptoms may also occur in patients without Marfan syndrome (4). Because the anomaly of the cardiovascular system of MFS is so fatal as to affect the life span, it is advisable to diagnose it as soon as possible and regularly follow up and manage it . Here, we described two pediatric cases without family history who were diagnosed with Marfan syndrome by chance. In the first case, a 6-year-old boy without birth history was diagnosed with chronic follicular tonsillitis, and underwent a basic test before receiving tonsillectomy. He had borderline prolonged QT on an electrocardiogram performed prior to surgery and was referred to a pediatric cardiologist. On physical examination, height was 122 cm, body weight was 19.5 kg, and arm span-to-height ratio was 0.96. The height was the 93rd percentile of the standard Korean curve, the 25th percentile of the Marfan syndrome curve reported by Kwun et al . The echocardiogram for further evaluation showed ASD secundum 5 mm, aortic dilatation, and sinus of valsalva 26 mm (z score>2) . Therefore, Marfan syndrome was strongly suspected and FBN1 gene sequencing was performed. Eventually, a molecular investigation identified a heterozygous c.7606G >A transition in exon 62. Twin of the patient was also tested for FBN1 gene for Marfan syndrome and the gene was confirmed (c.7606G >A in exon 2). There were no other abnormal findings such as ocular system, skin, skeletal system, lung system. After genetic confirmation, the patient is undergoing an echocardiogram once a year and taking β-blockers. Second case, a 14-year old boy had no birth history and past medical history. He visited our hospital for evaluation about recent event of pre-syncope. The initial blood pressure of the patient was 104/62 and the pulse rate was 62. In addition, there was no specific finding of blood pressure according to body position. On physical examination, height was 169 cm, body weight was 50 kg, and arm span-to-height ratio was 1.01. The height was the 98th percentile of the standard Korean curve, the 3rd percentile of the Marfan syndrome curve reported by Kwun et al . The electrocardiography for evaluation showed normal sinus rhythm with premature ventricular contraction. 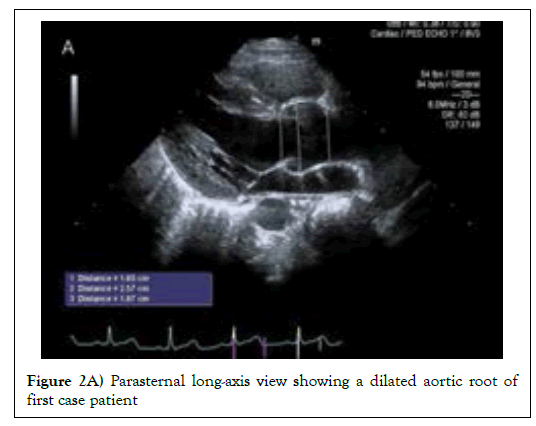 The echocardiogram showed aortic dilatation and sinus valsalva 31 mm (z score >2). At this point, Marfan syndrome was suspected. Thus, FBN1 gene sequencing was performed and heterozygous c.4267G >A transition was found in exon 2. The FBN1 genotype was tested to determine if his older brother had Marfan syndrome, but no mutation was found. The patient also had myopia (Right 4.2 diopter, Left 6 diopter) as a symptom of Marfan syndrome. After genetic confirmation, the patient is also regularly taking echocardiograms once a year and taking β-blocker (Figures 1 and 2). 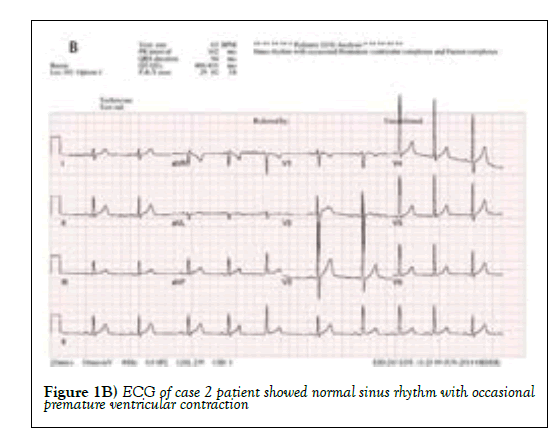 Figure 1b: ECG of case 2 patient showed normal sinus rhythm with occasional premature ventricular contraction. Since the clinical features of Marfan syndrome are age-dependent, diagnosis may be delayed in childhood when the symptoms are not apparent . All patients presented in this case study had a sinus of valsava Z score > 2 and a FBN1 gene mutation (c.7606G >A in case 1 patient, c.4267G > A in case 2 patient). Therefore, patients with this study were diagnosed with Marfan syndrome based on Ghent diagnostic criteria . Also, when reviewing each scoring of systemic features based on the revised Ghent diagnostic criteria, the first patient is 0 point and the second patient is 1 point with myopia. The patients in this study may have increased scoring of systemic features as they get older, but it is difficult to suspect Marfan syndrome with only the current clinical symptoms of these patients. If we considered the initial symptoms of the patient to be insignificant, these patients would have been delayed in diagnosis and treatment. Marfan syndrome is a disease characterized by high morbidity and mortality due to aortic dilatation, dissection and sudden death . The managements to reduce these cardiovascular complications include activity restriction, preventive aortic valve replacement, and β-blockers, which were known to have a protective effect on aortic root dilatation . In addition, angiotensinconverting- enzyme inhibitors (ACE I), calcium channel antagonists, and angiotensin receptor blockers (ARBs) have been proposed as alternative medical treatments, although β-blockers are the standard treatment in medical treatment . According to Groth et al, more than 50% of patients with Marfan syndrome were diagnosed after aortic dissection event, and the proportion of patients with cardiovascular event free with age declined gradually . Therefore, it is important to diagnose as soon as possible to reduce fatal cardiovascular complications. Like the cases presented in this study, patients without family history of Marfan syndrome may have a delayed diagnosis and a fatal cardiovascular event. Therefore, patients with symptoms such as pectus carinatum deformity, scoliosis, wrist and thumb sign and so on should be carefully examined with borderline increased arm span-to-height ratio. Early diagnosis of Marfan syndrome by echocardiogram evaluation and genetic testing may reduce emergency surgery, intervention, and sudden death. Moreover, it is cost-effective to diagnose patients with familial history of Marfan syndrome early by gene study. Her SM, Kang DY and Eun LY designed the study, collected data and wrote the manuscript. All authors read and approved the final manuscript. Canadas V, Vilacosta I, Bruna I, et al. Marfan syndrome. Part 1: Pathophysiology and diagnosis. Nat Rev Cardiol 2010;7:256-65. Judge DP, Dietz HC. Marfan's syndrome. Lancet 2005;366:1965-76. Loeys BL, Dietz HC, Braverman AC, et al. The revised ghent nosology for the marfan syndrome. J Med Genet 2010;47:476-85. Sponseller PD, Erkula G, Skolasky RL, et al. Improving clinical recognition of Marfan syndrome. J Bone Joint Surg Am 2010;92:1868-1875. Kwun Y, Kim SJ, Lee J, et al. Disease-specific growth charts of marfan syndrome patients in korea. J Korean Med Sci 2015;30:911-6. Colan SD, McElhinney DB, Crawford EC, et al. Validation and re-evaluation of a discriminant model predicting anatomic suitability for biventricular repair in neonates with aortic stenosis. J Am Coll Cardiol 2006;47:1858-65. Murdoch JL, Walker BA, Halpern BL, et al. Life expectancy and causes of death in the marfan syndrome. N Engl J Med 1972;286:804-808. Shores J, Berger KR, Murphy EA, et al. Progression of aortic dilatation and the benefit of long-term beta-adrenergic blockade in marfan's syndrome. N Engl J Med 1994;330:1335-1341. Lacro RV, Dietz HC, Sleeper LA, et al. Atenolol versus losartan in children and young adults with marfan's syndrome. N Engl J Med 2014;371:2061-2071. Groth KA, Stochholm K, Hove H, et al. Aortic events in a nationwide marfan syndrome cohort. Clin Res Cardiol 2017;106:105-112.